Emilio "The Vulture" Butragueño, former Spanish ace soccer player, assessed as very timely the campus conducted these days in this city by the Real Madrid Foundation with 100 children from 10 primary schools of Havana. 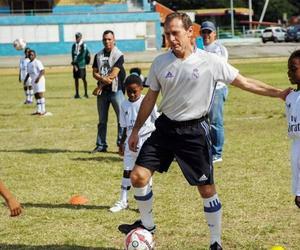 Butragueño, current Director of Institutional Relations of the club, was directly involved in this interesting activity, included among the 400 social projects that the foundation has in 73 countries, by kicking the ball and giving their knowledge to this group of children from the Cuban capital city.I urge you all to enjoy and learn as much as you can with these classes, soccer is a tool of education, respect for rival, fellowship, discipline and effort, and you must learn all these values to be better men and women in the society, he said. Winner of the Bronze Ball in 1986 and 1987 and included in the FIFA 100 list along with the considered 123 best soccer players in history, Butragueño highlighted the affection he has received from the Cuban people and the support of INDER to realize this interesting project with children. We hope that this first project will be the beginning of excellent sports relations with Cuba, which we hope to further extend, because with this visit we have proven that we can be successful here, he noted. Soccer relations between Real Madrid and Cuba date back from the same day of the foundation of the club, which in 1902 had four Cuban players, therefore, although this campus will only last five days, I think that others of longer duration will be conducted in the near future, Butragueño added. The Real Madrid Foundation includes here the coaches Juan Andrés González and Roberto Arias, who began to teach the children several warm-up and touch-ball exercises, as well as asking them for the most attention in each move.